Aficionados of Mexican cuisine may want to avert your eyes as I show off my Mole Chicken Chili in anticipation of Cinco de Mayo this Saturday. This is by no means authentic but that doesn’t mean it is not tasty. In fact, I happily drowned my chickpea flour-dusted roti with succulent pieces of chicken, mole sauce, fresh green scallions, and toasty sesame seeds. Being authentic is not the only way to be sometimes. Some days, I too crave chicken balls with day glo red sweet and sour sauce. This year I spent more time in the US than ever before. I must say, food costs significantly less south of the border. I’m easily tempted by a good deal so I ended up purchasing ingredients simply because they were of good value. The same doesn’t happen too often once I return to Canada. My gym is located inside a large grocery store 500m away from my front door. One of my favourite post-workout cool down activity is wandering aimlessly in the store. A friend once told me she doesn’t know anyone who spend as much time grocery shopping except perhaps her retired grandmother. I sheepishly agree. An upside of being a frequent shopper is that I spot out great deals quite frequently. Just a few days ago, it was chicken thighs that caught my eye. Naturally I had to figure out a meal to incorporate my latest bargain find. Since I started cooking and baking with other bloggers at French Fridays with Dorie, I’ve steadily accumulated a pile of photos from our weekly recipes. I skipped a few weeks here and there but I have been an active member of the group since November 2010. As much as I like the portability of having my photos readily available from online and offline storage, I still long for that tangible feeling of holding a photo album in my hands. About a year ago, I made an impulse purchase at Photobook when there was an irresistible sale for large format 11x11 hardcover filled with 40 pages. Obviously I conveniently forgot how much work it would require of me to put together not one, but two, albums. 80 blank pages to fill with photos that I style, shoot, curate, edit, and lay out…my head spins at the mere thought. Selective memory in the last 12 months shielded me from the consequence of my impulse purchase. It was only a couple of weeks ago when I realized with panic that my vouchers were about to expire at end of April. Fortunately, most of the photos I took of the dishes from Around My French Table are already edited to some degree. 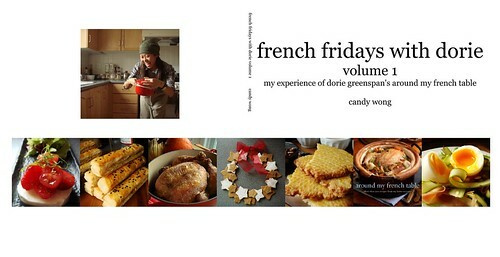 Putting together photo albums of my French Fridays experience was the least labour-intensive subject I could think of. A few nights of hard work later, I’m ready to submit my books for print. In exactly two weeks, I will be on my way to Denmark and Germany for World Masters Championship. The pressure of a big competition is mounting and I can feel it both mentally and physically. Comfort food is especially alluring right now but more importantly than ever, I have to eat healthy. How unfortunate. Because I’m experiencing the biggest craving for grilled cheese sandwiches right now. Back in February when Race Day was merely a mark on the calendar, I indulged in a batch of homemade pimento cheese. I never even knew about this southern cheesy staple until a road trip last Christmas to South Carolina. 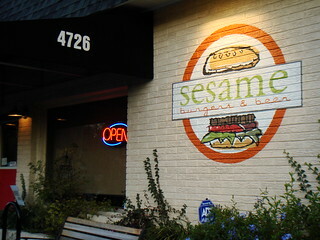 Boyfriend and I took his parents out to Sesame Burgers & Beer and I discovered the deliciousness of sharp cheddar seasoned with pimento peppers, mayonnaise, garlic, and hot sauce. The cheese spread melted yieldingly onto the juicy burger patty and I was hooked. 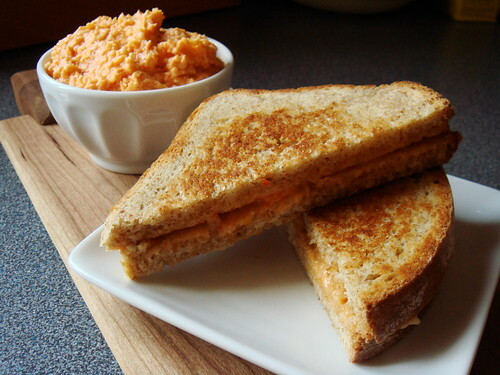 Like most kids in North America, grilled cheese as I knew it is Kraft single between buttered slices of Wonder Bread. I loved the combination so much that I would even eat a non-grilled version happily. My taste has gotten a bit more discerning since but grilled cheese sandwich still tugs at my heartstring. Except now, I want good cheese and good bread and good butter. Racing has brought me many travel opportunities over the years. For the last four years, I got to spend a weekend in Austin, Texas in April. Racing was obviously the focus so seeking out the best tacos and barbecue that Hill Country has to offer was not necessarily in the cards. It pained me every time to leave Texas without sampling their great barbecue. 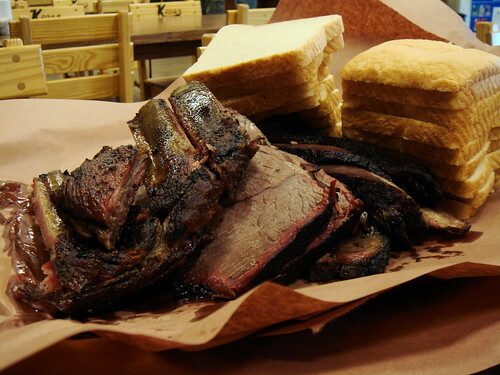 More than once, I ended up stuffing my face with a brisket sandwich bought at Salt Lick’s airport outpost. It was the last chance for Texas barbecue before the long flight home and I was desperate. With a bit of better planning, I finally got my taste of the great barbecue tradition from Lockhart, Texas. Before my early afternoon flight, a short road trip gave me not one, not two, but three highly-regard barbeque restaurants to enjoy. Obviously I had to try all. Kreuz Market, Black’s Barbecue, and Smitty’s Market were all excellent in their own right and unlike anything I’ve ever had. Being the only girl in our group of five, you would think I’m at a disadvantage when it comes to barbecue tasting. Not at all! My experience with food-centric vacation prepares me well. It’s about pacing and not be distracted by fillers. 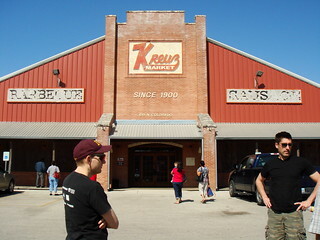 Our first stop at Kreuz included orders of brisket, shoulder, pork ribs, regular and jalapeno sausages. We arrived before the doors were open and our request for burnt ends was met with a burnished and crispy piece of brisket that I’m still thinking about. I’m all about the burnt ends! The sausages had great snap too and just the right about of smokiness. The guys couldn’t get enough and our group pretty much demolished the whole order. I wanted to warn them against all that water and bread but I was too occupied by the deliciousness in front of me. There are three important Candy Days in the calendar year: February 15, Easter Monday, and November 1. While most bargain hunters look forward to Black Friday or Boxing Day sale, I pin my hopes on half-priced chocolate in seasonal packaging that is just one day past their prime. It’s a good thing that my gym is located inside a grocery store because I never miss those sales. My finds this year included a 2lb bag of Cadbury Mini Eggs, a couple of Crème Eggs, and some classic yellow Peeps chicks. Marshmallow is my weakness so it’s no surprise my post-Easter haul always include a sleeve of Peeps. As far as Easter candies go, they don’t rate high on the desirability scale. Unlike popular choices such as Reese’s Peanut Butter Bunny/Egg or M&M’s Speckled Eggs, I can always find a pile of colourful Peeps even a whole week after the Easter long weekend. Some people like to play with their food and I am no exception. Although I don’t make anything as elaborate as a Peeps diorama, a little colour coordination using the bright yellow chicks as cake toppers can’t hurt. I’m in a spring kind of mood so an Almond Tea Cake with Tangerine Glaze is an appropriate choice. Every day is a different food holiday, it seems. My twitter stream never fails to remind me about Grilled Cheese Day or Hot Dog Day or Chocolate Day or whatnot. As silly as the notion is, as a food blogger I don’t mind these theme holidays since they provide good inspiration for what to make. Well, you know, even the most creative cook may need a bit of nudge from time to time when ideas run low. And then there are those strange moments when all the stars align. I realize after baking my Drunken Cherry Almond Brownie this morning that I celebrated National Amaretto Day. What are the chances? I rarely break out my bottle of amaretto and I did it on the most appropriate day of the year. The inspiration for this brownie comes from Boyfriend’s love for all things cherry and chocolate. We haven’t seen each other since February and I’m excited to finally see him this weekend in Austin! My new favourite brownie recipe takes well to add-ins. Since I last made it in Fort Lauderdale, I’ve been itching to make it again at home. The night before, I soaked a cup of dried sour cherries in amaretto to plump them up. When I woke up this morning, all the little morsels were drunken with the almond liqueur! I complemented them with half a cup each of coarsely chopped roasted almonds and white chocolate chips. 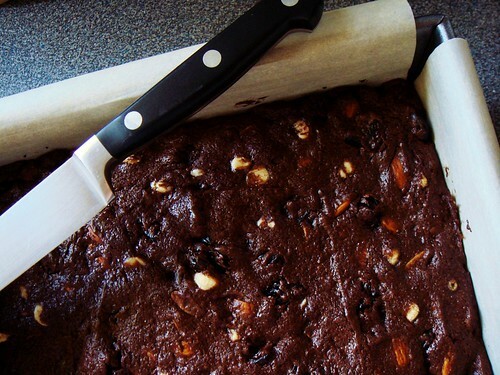 The brownie recipe as written would be a better fit in a 8x8 square cake pan. With all the extras, I bulked up the batter enough to fill a 9x9 square cake pan nicely. It finished baking at exactly the 30 minute mark. I wish I can tell you what it tastes like. If all goes according to plan, Boyfriend and I are not digging in to the brownies until Sunday noon! Good thing this is a good keeper. What I can tell you though is that my kitchen smelled absolutely amazing with the mix of deep dark chocolate and sweet almond and tart cherries. Happy Amaretto Day! Bento is not exclusive to Japanese cooking in my kitchen. The concept of portable lunch in a compact and visually pleasing package makes so much sense that I happily pack bento for all kinds of cuisines. Remember my French bento? Or my bento with Smoked Salmon Wild Rice and Vegetable Patties? How about that Spring Green bento? You can say that most of the time my bento meals have little to do with Japanese cuisine. I adapt it to the way I eat, not the other way around. Speaking of the way I eat, I’ve been craving the flavours of Moroccan cuisine lately. The heady aroma of cumin, paprika, and cinnamon; the tangy taste of lemon, pomegranate molasses, and yogurt; the sweetness of dried fruit; I want them all. 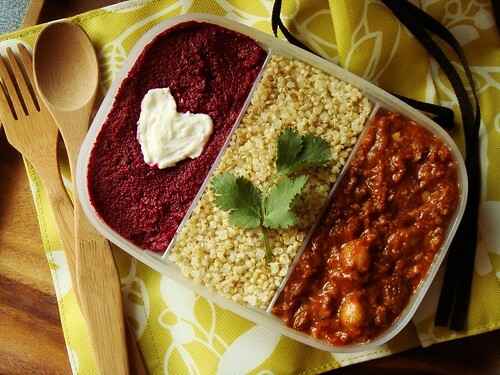 Last night’s dinner was a feast of Moroccan beef chili with chickpea and raisin, bay leaf-scented quinoa, beet hummus, and Greek yogurt. The ingredients are decidedly not Moroccan but the tastes definitely transported me to more exotic locale than Toronto. To extend that culinary vacation, I packed the leftovers into a Moroccan inspired bento. Leftover lunch can be glorious too! Decadent dessert is a crowd pleaser whether you’re strolling into a potluck or posting mouth watering photos online. The camera loves them and so do my friends. My waistline? Not so much. You already know you don’t need me to preach the importance of moderation. Having said all that, what I feed myself on a daily basis ought to be nutritious and appetizing. They may not draw oooh’s and aaah’s but this is the type of cooking that makes the occasional decadence that much more satisfying. I’m pretty exhausted these days from a demanding work and training schedule. In exactly a month from today I’ll be racing in Germany representing Canada. Race preparation is at fever pitch with travel logistics falling into place and daily workout taking highest priority in my schedule. Between the moment I get home and bedtime, I am so spent that only the most urgent matters catch my attention: eat, shower, and unwind. Cooking and baking normally help me relax mentally but I just cannot muster enough energy to make anything complicated. Dishes that require minimal hands-on time or can be prepared in stages are my lifesaver these days. 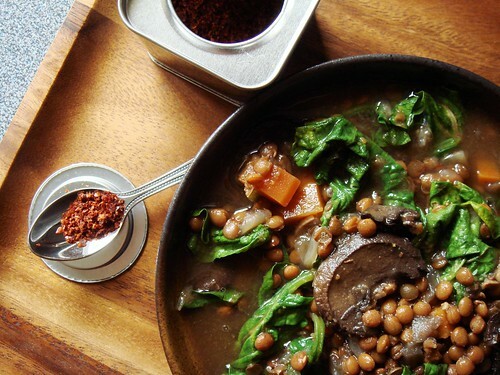 Perfect examples include slow cooker Ultimate Lentil Soup and Forbidden Black Rice & Quinoa Salad with Avocado. I recently moved from an open space set up to a cubicle at the office. The novelty factor hasn’t worn off yet and I’m still enjoying the additional privacy. However, it does get a little lonely compare to the old days when chatting with my teammates is a simple matter of cranking my neck a little to the left. Since I spend much of my waking hours at the office, it makes sense that there are certain elements of “living” that I do in my space. For example, I keep a set of toothbrush, toothpaste, and floss within easy reach. I also have my music collection and a few small plush toys lying about. Pretty normal stuff. 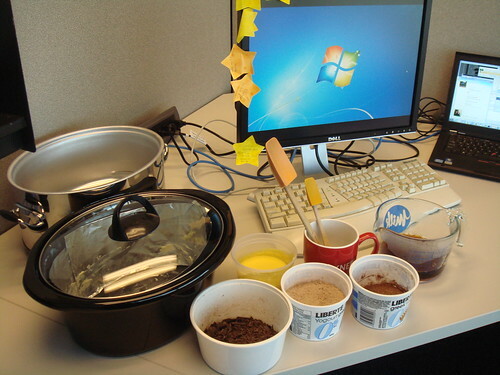 Eating at the desk can be a controversial issues at some office. Thankfully it is not frown upon at mine. Today, I took it one small step further. A Mocha Pudding Cake is baking right next to me at this very second. If it turns out well, you can thank the cool people at America’s Test Kitchen. I adapted their slow cooker chocolate pudding cake recipe from Slow Cooker Revolution adding a touch of coffee flavour. It all began with meticulous mise en place. 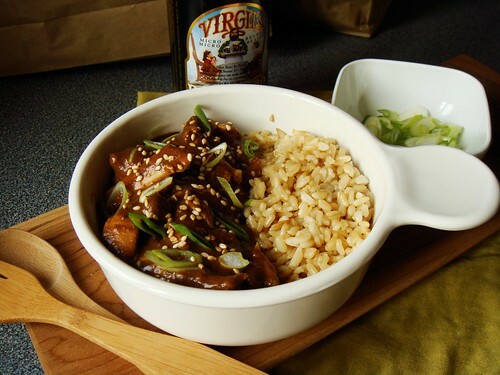 Before I left home, I scaled out the ingredients in individual containers and greased the slow cooker. It’s all about being prepared! All that was left to do once I got to the office was the final mixing. I must be living a pretty boring life because I get excited over a new cake pan I bought on Saturday. 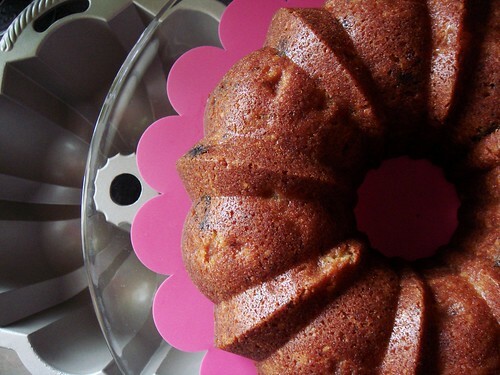 For the longest time, I do not own a classic bundt cake pan. My star shape bundt pan gave me plenty of beautiful cakes but it was getting a little monotonous. 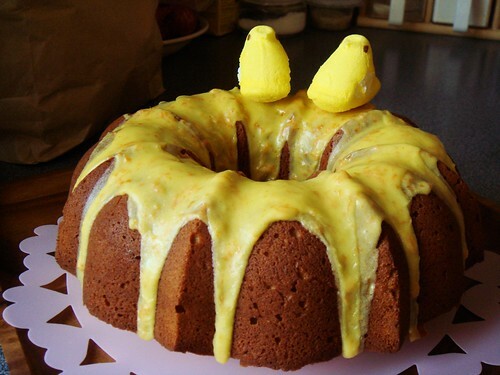 Every time I saw other people’s photos of bundt cakes, I experienced a bad case of pan envy. Well, envy no more. I finally bought my own classic bundt pan and it’s not just any bundt pan. I got the Cadillac of all things bundt: Nordic Ware Original Platinum Collection Bundt Pan made with heavy weight cast aluminum. Ooooooh yeeeeeaah. You don’t have to ask what I did with the pan the very same day I brought it home. Of course I baptised it with cake. Not just any pound cake but a buttery one made with brown sugar and studded with juicy pears, prunes, and ground hazelnut. You see that deep brown crust? That’s the reason I don’t buy flimsy supermarket cake pans. The even gentle heat that a heavy cast aluminum pan holds cannot be rivalled.